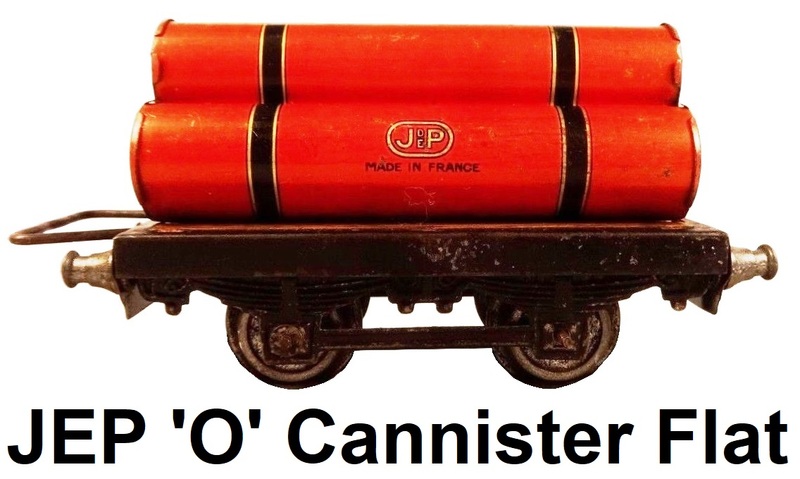 JEP was a French manufacturer that made trains in O/O27, S, OO and HO gauge. They also made lithographed, tin, clockwork toy automobiles, motorcycles, aircraft and other motor miniatures. JEP cars traditionally carried a trademark on the radiator of the particular vehicle replicated. The company's history dates back as far as 1899. It was organized as Le jouet de Paris in 1902 by Messrs. Roussel and Dufrien with the intention to create a common toy market that would include not just their own toy company's output, but also include the products of a multitude of small creatively-fertile 'ferblantier' or 'tinsmithing' companies that were dotted around Eastern Paris. Roussel and Dufrien recognized that while Parisian toy manufacturing had a healthy design and manufacturing base, a single catalogue and branding would make it easier to market the products. The consortium consisted of G. Potier who owned the "Dessein" brand, and had already merged it with Faivre, who previously organized a deal with Vilain and Lefevre, as well as Douliot, Leconte & Cie, Duclos, Tantet, Manon, and Richard Freres. In 1902 the first catalogue was issued. A huge range of toys was included. By 1906 the company expanded rapidly and between 1908-9 a large factory with modern machinery was opened. The company's manufacturing plant was located at 94 rue de Paris in Montreuil-Sous-Bois. The plant had 10,000 square meters of floor space for manufacturing the toys such as 1/18 scale cars, boats, canoes, roller skates, beach accessories, stoves, planes and trains. 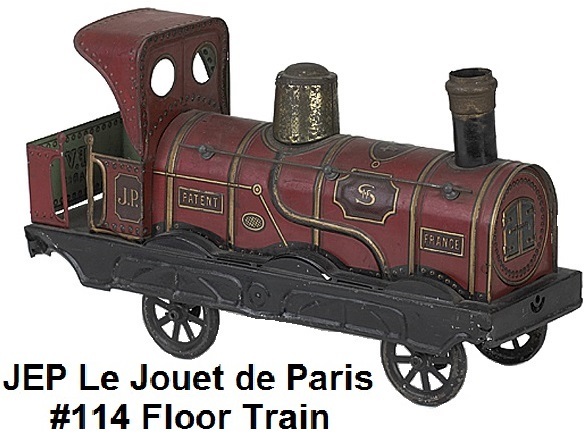 However, by 1909 Le jouet de Paris found itself in financial difficulties and was forced to file for bankruptcy. In 1899 a similar organization named the Société Industrielle de Ferblanterie (SIF) had been formed in Paris as a consortium of 7 other toy makers who were also metalworking companies. In 1909 they took over Le jouet de Paris, and these companies joined forces to produce toys under the label 'JP'. Eventually this label changed into 'J et P' and in 1928 into 'JEP'. Under this name the brand achieved great success, as technical systems for manufacturing were continually improved. SIF was headquartered at 39 rue Beaumarchais in the third district of Paris. The manufacturing plant remained at the 94 rue de Paris location. SIF distributed and sold toys all over France and Europe (Lyon, Algiers, Amsterdam, Cairo, Zurich, Casablanca, Brussels and Gothenburg). Some toys made between 1909 and 1914 may bear both the inscriptions 'SIF' and 'JP'. The company, like so many others around the world, initially made floor trains but quickly adopted the German section tin-track system for its trains and the idea of a steadily growing railway empire, so they could produce and sell track, switches, trackside accessories, cast figures and extra rolling stock to train set purchasers. Trains were made of lithographed tinplate. During the 1st World War the company was requisitioned by the army to produce military accessories in tin plate. Primarilly Adrian helmets were made for the army, under then director Cyril Bonnet. After the war, toy manufacturing was resumed. In 1925 JEP launched a range of 'OO' trains called the 'Train Mignon' establishing the company as the first French manufacturer to produce trains in 'OO' scale, and following the lead of the German firm Bing that had released their first 'OO' Miniature Table Railway products in 1922. 'OO' gauge trains became the precursors of HO trains. JEP 'OO' utilized the same distance between the outside track rails as Bing, but the size of the locomotives and cars was much larger in comparison. JEP produced versions in both 2-rail as well as 3-rail and both electric outline and steam outline models. The electric outline models were fitted with a crude catenary and ran via an overhead gantry system, which was included with the set. This was the first use of a functioning overhead catenary with 'OO' scale. The steam outline locomotive came in clockwork powered and electric motor powered versions, while the electric outline loco was always powered by an electric motor. Electric current was provided by a rheostat that used a light bulb as a resistor, and wall current. The rheostat came with two different reduction bulbs for 110V and 220V current. 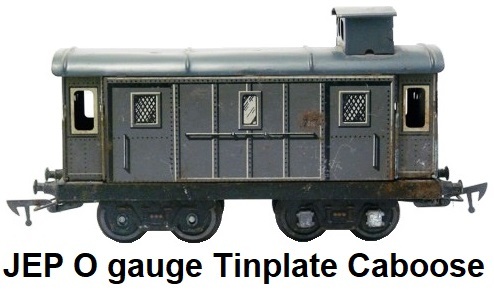 These trains were issued in sets with 4-wheel tinplate passenger cars, track, transformer, and accessories, such as signals, pylons, piers, bridges, a water tower and tinplate stations. The unique 'OO' gauge track system was designed to stand on small pedestals. Instructions were printed in both French and English, so it is believed these train sets were intended for overseas export to England, Canada and the United States. The steam outline version was called the 'Pacific Mignon' while the electric outline loco version was called the 'Electric Trolley'. Primary JEP production continued to be in 'O' gauge however. The company achieved great success in the 1920's and in the Golden Age of the 30's with highly appealing and detailed models of French trains. The 'Pacific' locomotive, 'Triple Blue' railcar and 'Fleche d'or' (Golden Arrow) are fine examples of these high quality trains that could compete with the best productions worldwide, including the German manufacturers. 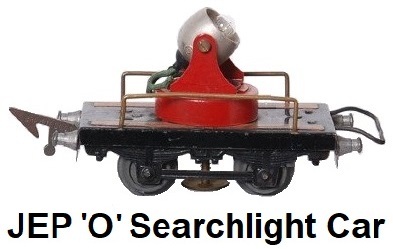 The 'O' gauge trains were offered in both electric powered 20 volt 3-rail versions and mechanical clockwork versions. They were equipped with a universal motor that could operate using AC or DC current. JEP locomotives equipped with an S52 universal motor did not need a manual reversing switch as these motors handled the inversion by a momentary cutting of the track current. A universal motor is a DC motor with a series excitation method implemented. In this scenario the rotor is connected in series with the inductor winding. The inductor is composed of two separate windings. This allows switching from one winding to the other, and thus the direction of the current in the inductor is reversed, allowing the rotor to turn in the opposite direction. The new locomotives were modeled after the real prototypes that ran on the French railways and were examples of the beginnings of a trend towards more realistic and less toy-like trains. In 1932 the company was run by a tinsmith named Grasset. By 1935 the factory in Montreuil, a suburb of Paris, employed over 750 workers and was handling over 10 tons of material each day. In the post WWII period JEP switched to die-casting. Commerce in France was recovering, but manufacturers such as JEP were hit by huge shortages in raw materials. 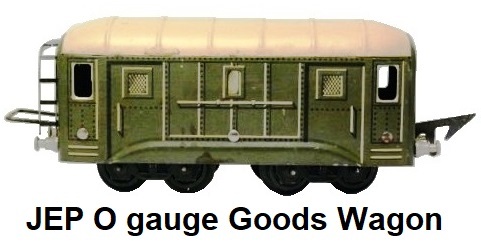 However by 1948 things had recovered, and a range of HO gauge trains were added to the line in 1949. These HO trains were made of zamac until 1952 when plastic was introduced. Like Märklin HO, these trains were 3-rail. 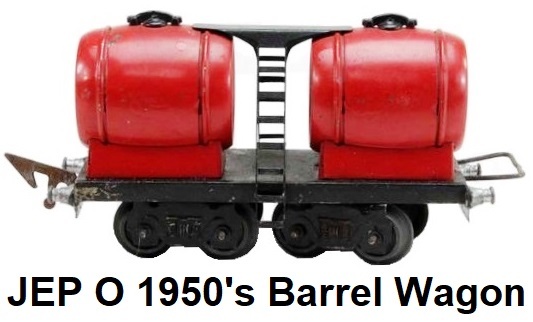 The rolling stock and locomotives in HO were referred to as 'OO' in early catalogues up until 1953, and were smaller versions of the very same 'O' gauge products that JEP made. Finally by 1954 the term HO was used in catalogues to refer to this scale model train. The early issue HO track was mounted on an all metal base with simulated lithographed ties or 'sleepers' as the Europeans refer to them. 1954 also saw a change to plastic ties for the 3-rail HO track. It was during this period that products such as the R 232, the 2D2 9101, the PLM 2-8-2, BB 8100, CC 7100 and the famous passenger cars were produced. Other new issues included the 60 series #131T steam locomotive and the #141P steam locomotive that was a precise replica of the SNCF prototype. 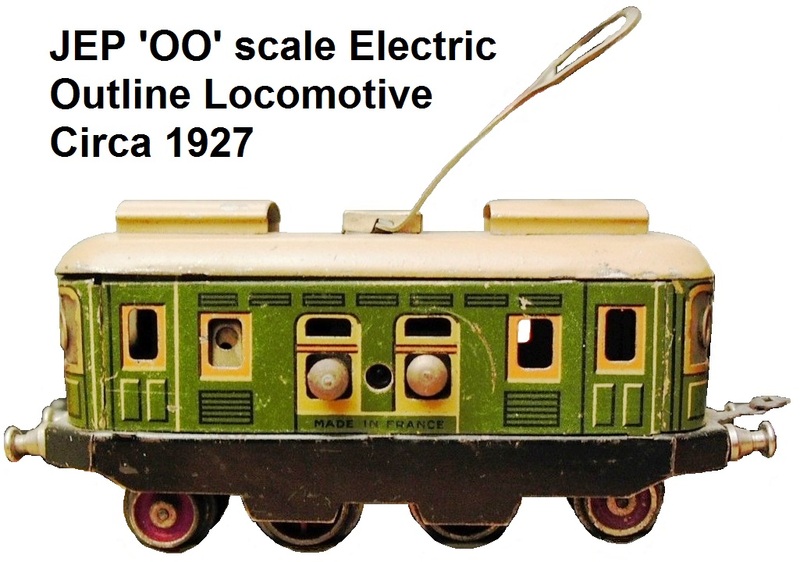 The 'O' gauge line was converted from 20 volt AC to exclusively run on 20 volt DC, with the elimination of the universal motor. The new AP5 motor was a permanent magnet type. This allowed for use of the same transformers sold for the HO train line. Track and trains remained 3-rail however. The company competed with the likes of Hornby France, Jouef, Edobaud, Marescot and LR (Le Rapide), and other French manufacturers. The post war products where completely different than previous production. While the engines became more scale like models, the entire line of rolling stock and passenger cars were produced without modification for 35 years, except for the inclusion of automatic couplers in 1952. Freight and passenger cars came with a hook and wire loop between 1933-51 and had 2 bogies, each with 4 wheels. The so-called 'automatic couplers' consisted of a small hook and lever at each end of the car. The 4-wheel, 2 axle freight cars were introduced in 1952 as well. 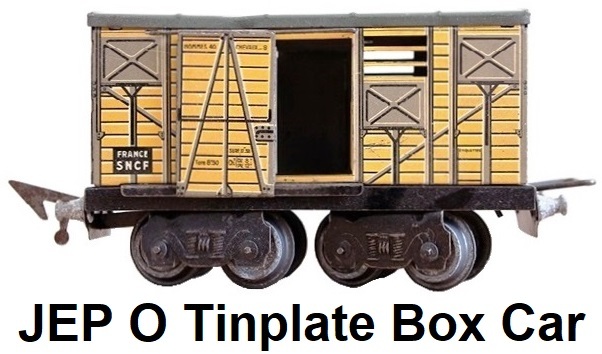 These freight cars were made of tinplate and were lithographed in a number of different color combinations. JEP passenger cars came in many color combinations but the most common were the blue and cream Pullman cars. The JEP freight and passenger cars were fitted with hook and wire loop type couplings between 1933 and 1951. From 1952 to 1966 automatic couplers using a small hook replaced the original hook and wire loop design. In 1952 JEP ceased manufacture of their famous CC 7001 electric outline locomotive. It was replaced in 1957 by the 141P 2-8-2 steam outline locomotive that without being rigorously to scale still provided a handsome profile. JEP had studied prototype locomotives of the larger European lines to come up with this design. The boiler was cast in zamac and the loco was fitted with two mechanically linked AP5 DC motors. Its operation was particularly gentle and powerful. The silence of operation was impressive. It became a popular manufactured toy product that was very close to those models traditionally made by craftsmen and sold to wealthy collectors. With this superb machine, JEP had made considerable progress in eclipsing its rival Hornby with their well-drawn BB 13001 and 9201. But unfortunately there was a 'but'. The price at the time was 27500 French francs, which was almost a month of wages of the average worker in 1957. Its use of zamac, which is an alloy of lead and steel, made it fragile over time and many of the 141P's fell victim to metal disease and are now dust. JEP never updated their line of freight or passenger wagons whose design dated back 20 to 30 years earlier, so there was no comparable rolling stock to run with this beautiful engine. Only 2 to 3 thousand 141P's were built making this a very rare and valuable locomotive today. It was always sold separately and never incorporated into a set. In the 1950's business slowed again. As train sales fell JEP tried to market an S gauge (25 mm) system which failed, and a new line of automobiles in 1/43 scale made of plastic and zamac, that could not compete in a market dominated by other brands. 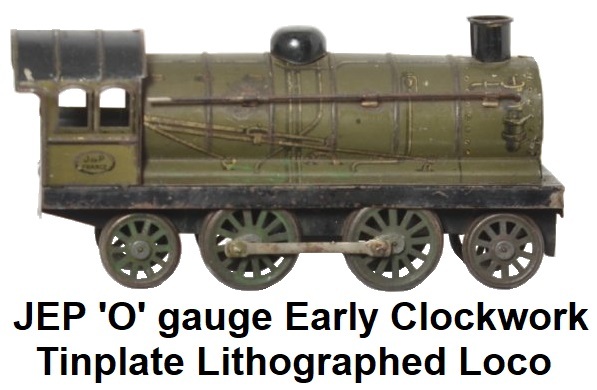 The S gauge trains featured both electric and mechanically (clockwork) powered locomotives. The work force was reduced to around 500 employees. To keep sales going and compete with the other manufacturers, in 1955 JEP began making plastic toys and trains. Between 1956 and 59, the catalog of items increased by 30%. Around this time, JEP began to outsource some of its train manufacturing to Rateau. In 1959, as a subcontractor, Rateau manufactured three sheet metal passenger coaches. This included two CIWL Pullman cars and a postal van. Sales of JEP trains continued to decline however due to increased competition, primarily from Jouef and Hornby. In 1961 JEP acquired French competitor Le Rapide. However, 'O' gauge train production was ended in 1963. JEP ceased production of HO model trains and toys in 1965. Manufacturing was shifted primarily to parts for the automobile industry. The name lives on, having been purchased by the company Jouet Montblanc. While the JEP trains have not been manufactured for many years, they are still readily found on eBay and other on-line auction sites today.